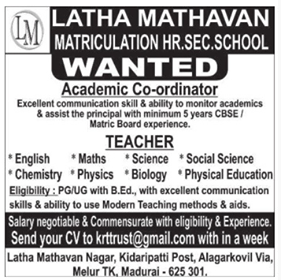 Latha Mathavan Matriculation Hr Sec School, Madurai has advertised in Dinamalar newspaper for the recruitment of Teachers jobs vacancies. Interested and eligible job aspirants are requested to apply with in a week. Check out further more details below. About School: Latha Mathavan Matriculation School was inaugurated on 24.09.2009 with the aim is to provide quality education to prepare leaders of tomorrow and also to establish educational institution with a high standard. The school is handling both day scholar students as well as boarding school students catering for students from near and far and will be equipped with all required facilities.